“Wargame” kits are generally looked down upon by most “scale” modelers as they take a number of shortcuts and make a lot of compromises when producing a model. But it is understandable, as nobody who wants to field a battalion or regiment of tanks and infantry wants to spend $50 a kit and then have to put together up to 1,300 parts to get a single tank finished. It’s more a case of “stick ‘em, slam ‘em, paint ‘em, and fight ‘em.” They are also inexpensive. When I was a kid, the choice was usually either ROCO or Roskopf, as they were all someplace between 1/87 and 1/100 scale, cost 25 to 40 cents each, and could quickly be painted and placed into action. 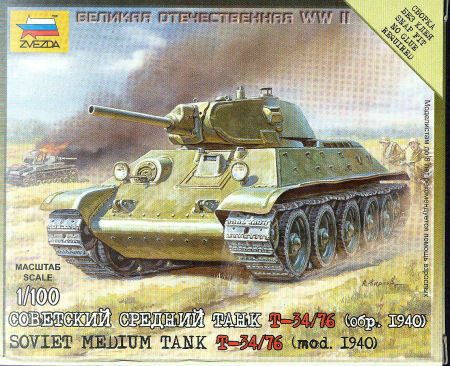 But over the years ROCO has gone through five or six generations of kits, and now they are approaching 1/35 scale kits in quality – and price. As a result many companies have now started to go into wargame armor to produce simple but attractive pieces which are sturdy, easy to assemble, and relatively inexpensive. It is a typical wargame effort – there are only five parts on a single sprue. You clip off the turret, hull top and belly, track runs, cement them together, paint and mark them, and boom! - instant T-34. While obviously spartan in its design surprisingly the model is quite accurate and in some cases is better than larger scale models in getting the angles and details right. Drilling out the gun barrel, careful painting and weathering, and some after-market decals will produce a very nice little model in its own right. As it is for wargaming, the kit also provides a statistic card for use in the “Art of Tactic - Great Patriotic” (also called Operation Barbarossa 1941) wargame system, which is a set of miniatures rules which can be expanded by such sets. Overall this isn’t a bad idea and is a cheap way to wargame, or just practice your skills on an inexpensive kit.